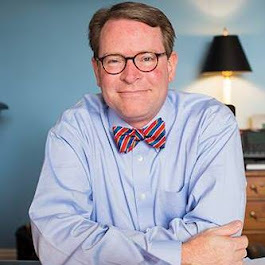 Old North State Politics: Can The GOP Appeal to Voters Who Roll Their Eyes? Can The GOP Appeal to Voters Who Roll Their Eyes? 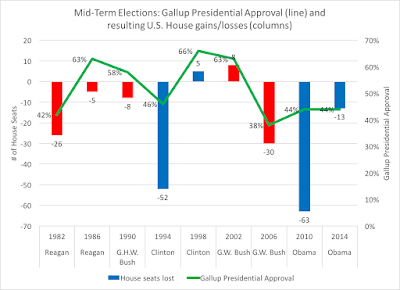 This blog post appears at WFAE's The Party Line and includes the graphics for the 2012 general election that was not included there. In their rather blunt assessment of the debacle that was the 2012 election, the Republican National Committee came to a simple conclusion: we can’t continue down the path we’re currently on and remain political relevant. In particular, the report acknowledged that “[y]oung voters are increasingly rolling their eyes at what the Party represents, and many minorities wrongly think that Republicans do not like them or want them in the country. When someone rolls their eyes at us, they are not likely to open their ears to us” (page 4). With North Carolina being the closest state that the GOP presidential candidate won in 2012 and that continues to be a battleground presidential state, the Republicans should also look more in-depth at these two voting blocs to see what specifically they are up against in future electoral contests. In the 2012 general election, voters who were 18-25 years old made up 10% of the ballots cast, while those 26-40 were 22%, those 41-65 were 48%, and those 66 and older were 20% of the ballots cast. Granted, 10% of the total electorate isn’t that much, but considering that Romney won this state by only 2% out of 4.6 million votes cast, GOP and Democratic strategists should investigate their perspectives. 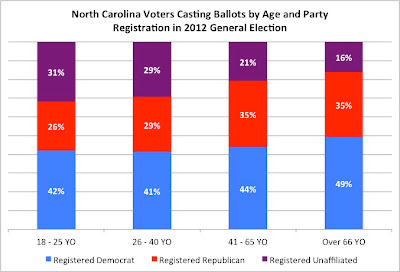 If you look at the party registration figures within these various age groups, you will find the reason why GOP is bringing new resolve to attracting younger voters. For those voters who entered the political realm in 2012, barely a quarter of them were registered Republicans. 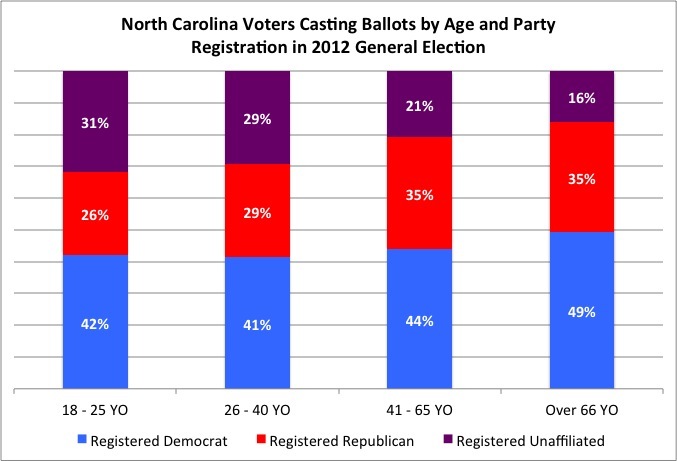 Among the next age group, registered Republicans were tied with registered unaffiliated voters, which should be a worrisome sign for the Grand Old Party. Within the youngest voter bracket, the party registration figures between white votes and non-white voters show a devastating difference between the two groups. Only 4% of non-white voters were registered Republicans, in comparison to non-Hispanic/Latino white voters, a plurality (42%) a plurality of whom were registered Republicans. Granted, we would expect Southern white voters to lean Republican, but the groups that are experiencing the largest growth in population, and soon to be electoral strength, are non-white voters. 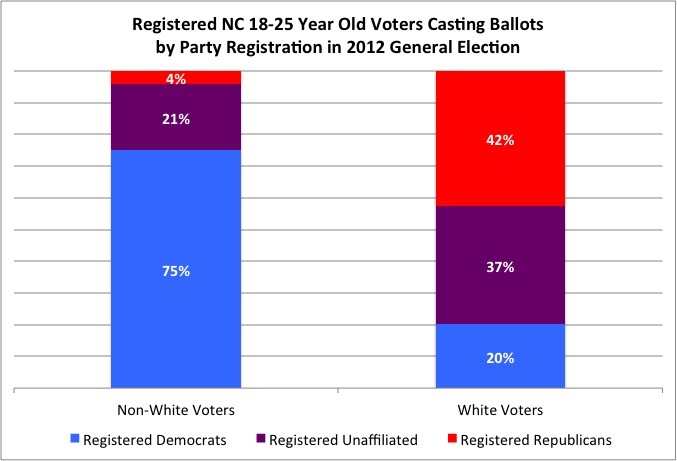 In breaking down non-white voters casting ballots, we would expect black voters to be overwhelmingly registered Democrats, and the numbers from last year’s general election show that 81% of 18-25 year old black voters were registered Democrats, with 17% being registered unaffiliated. Only 2% of young black voters were registered Republicans. 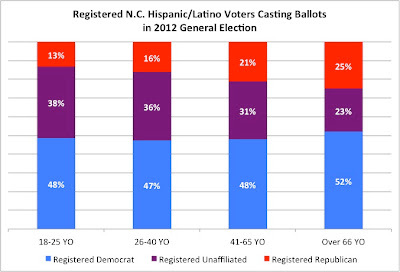 Among the other key demographic group, Hispanic/Latino voters, registered Democrats made up nearly half of each age group, but as you go from older to younger Hispanic/Latino voters, the percentage of registered Republicans drops from 25% to 13%. If your party can’t even get a growing population to register with your party, how do you expect them to vote for your part? 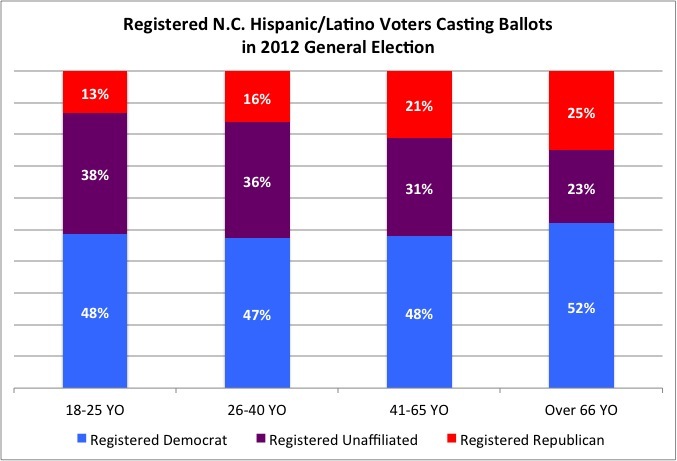 The only saving grace for the GOP among NC Hispanic/Latino voters is the fact that 38% of young voters are registered unaffiliated, and so they may be open to future persuasion. But if the national party choose to continue its current trajectory, that of being overwhelmingly white and older, it will work its way into minority status at the national level. According to the Pew Research Center, a plurality of GOP (45%) identify themselves as “staunch conservatives,” and of these Republicans, 92% are white. This group is also male, Protestant, and at least 50 years old. And among this significant group within the GOP, the animosity to President Obama and the view that the growing number of Latinos in America is a “change for the worst” may not allow the party move its message into one that is more welcoming to minorities and young voters. As I’ve noted before, North Carolina’s new status of presidential battleground state may offer the national GOP a chance to roadtest a new message to appeal to a broader swath of the electorate. But if the members behind the party refuse to accept the “new message,” it doesn’t matter how many Facebook pages, tweets, or other social media initiatives the party develops.